Register now for #ANC19—the networking event of the year and read on to learn more about the opening general session keynote speaker! Jon Dorenbos credits some hard knocks with making him the successful man he is today. At just 12 years old, his father murdered his mother and was sentenced to 13 years in prison. Dorenbos and his sister Kristina initially lived with a foster family before moving in with their Aunt Susan. Like many teenagers, Dorenbos soon found himself falling in love—not with a girl, but with magic! After being mesmerized by a performance, he’d rehearse for hours each day in front of the mirror. His enthusiasm was nurtured by Ken Sands, a friend of Aunt Susan, himself a magician who became a mentor and father figure to Dorenbos, helping him discover his talents as an artist. There were more setbacks to overcome on his journey. In school, Dorenbos discovered another passion: this time for athletics. In high school, he played football, basketball, hockey and baseball, ultimately leading to a professional career as a long snapper in the NFL. That, too, had a rocky start marked by injury and lack of support until he signed with the Philadelphia Eagles and fate gave him opportunities to shine. Over his 11 years with the team—which made him the longest-tenured professional athlete in Philadelphia—he won numerous awards, made two Pro Bowl appearances and earned the record for the most consecutive games in Eagles franchise history (162). But after being traded to the New Orleans Saints in 2018, Dorenbos was forced to retire abruptly after being diagnosed with a life-threatening heart condition that required emergency surgery. 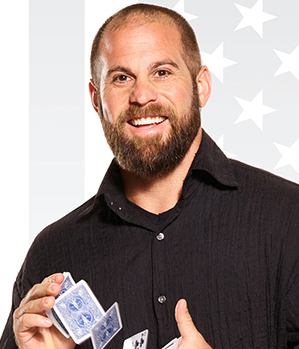 While playing football, Dorenbos developed a parallel career as a professional magician and motivational speaker. He earned a spot on Season 11 of “America’s Got Talent” in 2016, ultimately placing third. Earlier this year, Dorenbos was recruited to return to compete on “America’s Got Talent: The Champions,” where he placed in the Top 10. He’s made multiple appearances on “The Ellen Degeneres Show,” as well as “The Price Is Right” and other programs. Today, with his first child on the way, a book expected to be published this fall and major motion picture based on his life in the works, Dorenbos’s infectious positivity is something that touches everyone he encounters. You won’t want to miss this once-in-a-lifetime opportunity to be touched by the magic of this popular entertainer in St. Louis during #ANC19!